This was our second trip to Aras Napal, Sumatra. 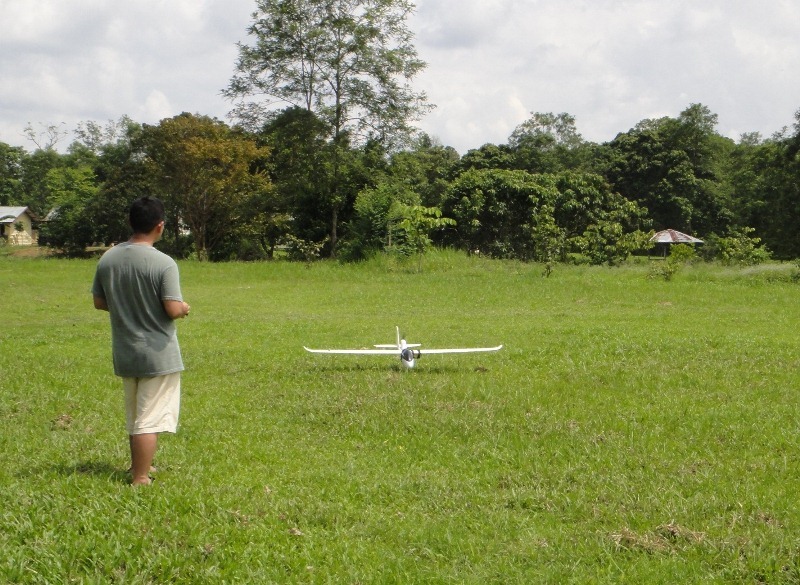 We were here several months earlier test-flying a prototype model of our Conservation Drones. 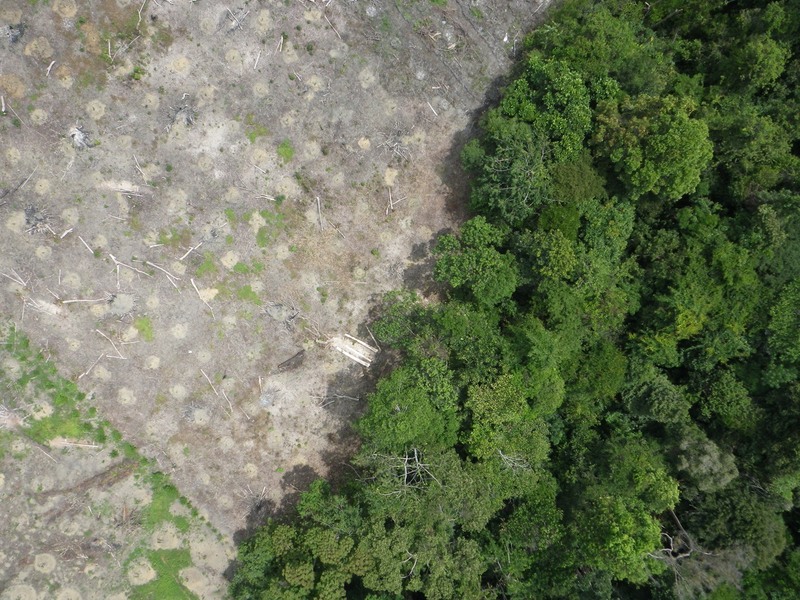 Those initial test-flights were wildly successful in terms of obtaining video and photographic images of orangutans and elephants, as well as land use activities such as logging, fires, and oil palm expansion. What we failed to capture were photographs of orangutan nests. This came as no surprise as orangutan nests are hard to detect in the thick closed-canopy rainforests of Sumatra, even from helicopter and small-aircraft surveys. 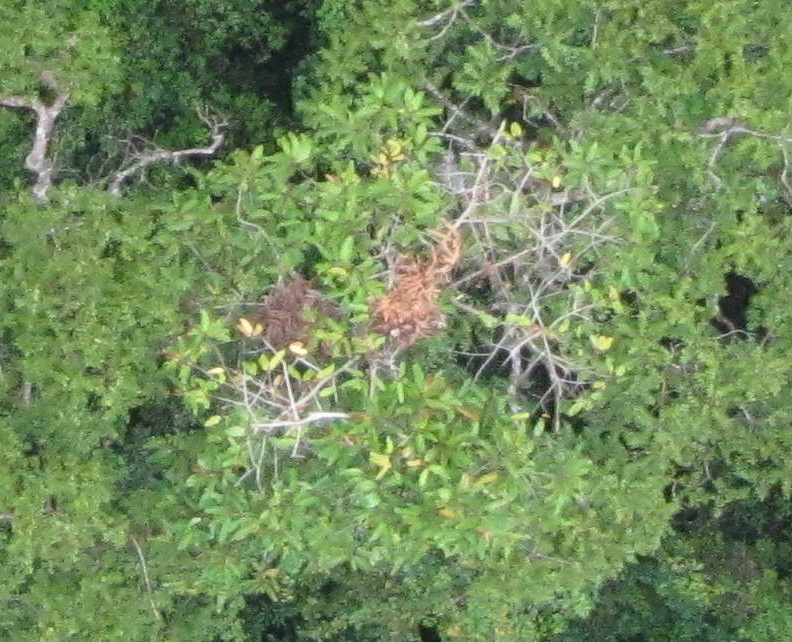 But we were so convinced that Conservation Drones can spot these nests that we came back to the forest for another shot. This was the third day we were out in an open field adjacent to the rainforest, but we saw no orangutan nests… yet. We went through the usual pre-flight checks for the next mission, as our faces dripped with sweat from standing in the scorching sun. This was a 10-minute mission over a pre- programmed grid above the last large remaining lowland rainforest in the eastern part of the 2.5 million hectare Leuser Ecosystem: an amazing stretch of rainforest and one of the last strongholds of Sumatran tigers, orangutans and elephants. The Leuser area stretches two provinces and is important for biodiversity conservation, while at the same time providing a multitude of ecosystem services for the people living around these forests and beyond. At the flick of a switch on the radio transmitter and a gentle toss, the Conservation Drone took off into the wind. The 10-minute wait provided a much needed respite from the sun. We sat down in the shade and discussed how the flight parameters would need to be fine-tuned if this flight did not provide us with photographs of orangutan nests. It is always exhilarating to be waiting for the Conservation Drone to return with the next stash of high-resolution photographs or video. After about 10 minutes we spotted the returning drone in the distance above the forest. Next came the reassuring humming sound of the drone’s electric motor. We had programmed the drone so that it would circle 80 meters above us upon its return, so that we could manually bring it down for landing. Once the drone touched down on the ground, we could hardly wait to bring it into the dining area of the campsite, which doubled up as our field lab during the day. A squeaking ceiling fan brought us much needed relief from the heat; thankfully the electricity supply held up that day. Several dining tables were covered with computers, spare parts, and tools. We immediately downloaded the acquired images from the drone to a laptop. And we started to browse through numerous images for orangutans nests. As soon as we started to look at the images we knew this time we had nailed the settings for both the flight altitude and camera focal length. The images were crisp and showed an amazing amount of detail. On the first few images, we could even count the individual leaves of one of the common pioneer tree genus here – Macaranga. We quickly scanned more images and after a few more we found what we had been looking for, an orangutan nest. The broken and bent branches that are so characteristic of orangutan nests were clearly visible. And then we spotted another nest, and yet another. We were relieved. The Conservation Drone project started with the aim of capturing photographs or video recordings of orangutan nests for monitoring the distribution and density of these great apes. Having finally achieved that goal on this trip was supremely rewarding. 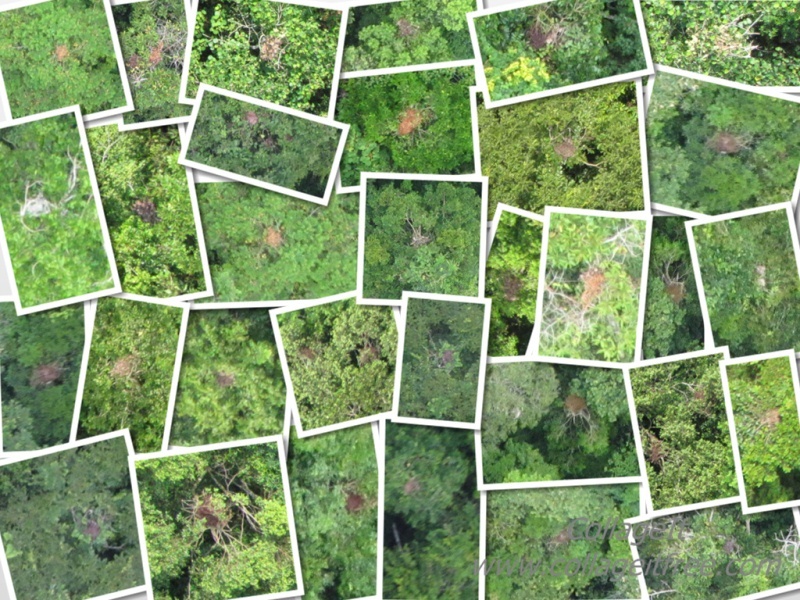 The results from our trip clearly demonstrate the utility of Conservation Drones for mapping and monitoring the distribution of orangutan nests. 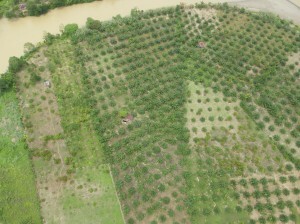 The next crucial step will be to develop a Conservation Drone protocol for calculating orangutan nest density. This will require a large number of flights above a forest where ground surveys are being conducted at the same time. We hope to secure funding in the coming months to conduct such a study in Sumatra or Borneo. The initial idea to do survey work with drones came about only a year ago when we were having a coffee in Zurich while discussing issues concerning oil palm expansion, deforestation, and biodiversity conservation in general. Naturally orangutans came up in the discussion due to their precarious conservation status, and the ever worsening threat from expansion of oil palm plantations. Because it is so costly in terms of both time and finances to acquire data on orangutan distribution and density, researchers were unable do it at the frequency needed to accurately monitor their populations. At that point in our conversation, we quickly realized that unmanned aerial vehicles could potentially be a game-changer for addressing this problem. Not long after that meeting, we successfully secured a seed grant from the National Geographic Society to kick-start the Conservation Drone project. Things moved fast from then on as the Orangutan Conservancy, Denver Zoo, Philadelphia Zoo and even some local hobby shops (ready2fly.ch) began to support our cause. 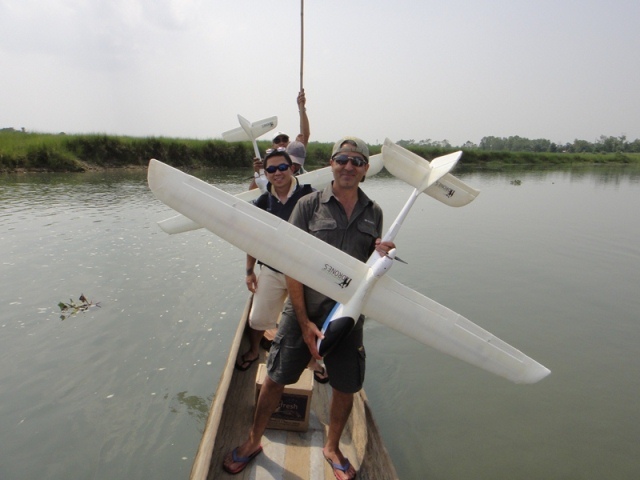 Since then we have successfully test-flown Conservation Drones across several countries in Asia through working with local collaborators, including WWF Nepal (FIG), the Sumatran Orangutan Conservation Program (SOCP), and other colleagues. Conservation Drones are being used for mapping land use and land cover, surveying wildlife (orangutans, elephants and rhinos) and even for anti-poaching efforts. We developed Conservation Drones with a clear mission: our drone system must be inexpensive and user-friendly. With some initial training, conservation workers in developing countries would be able to use and maintain these drones. We have also created a blog to keep our collaborators updated on the latest developments, test-flights and general progress of the project (www.ConservationDrones.org). We are definitely not resting on our laurels. 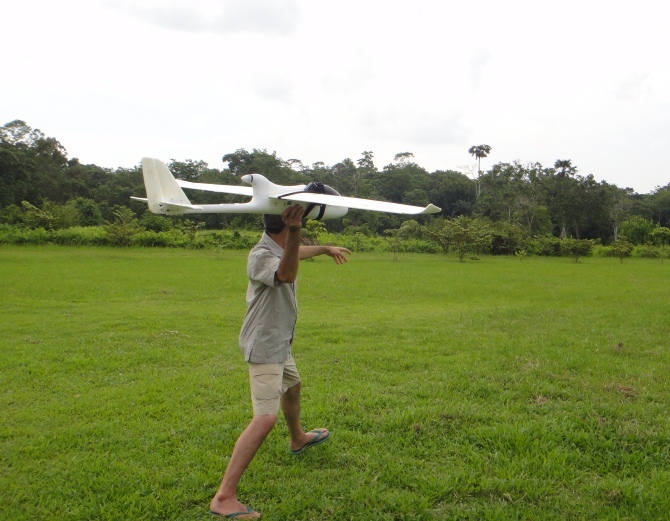 In fact we are already busy developing yet another version of Conservation Drones that would have smaller requirements for landing space, be more portable in the forest, and be able to carry a wider diversity of image sensors. Lian Pin Koh is Assistant Professor of Applied Ecology and Conservation at the ETH Zürich. Research within his group focuses on addressing emerging environmental and socioeconomic challenges facing tropical developing nations including intensifying land-use conflicts, carbon emissions from land-use change and forestry, and threats to natural ecosystems and wildlife. Lian Pin employs a variety of scientific approaches including field surveys and experiments, and developing theoretical and computer simulation models. He also develops and implements innovative approaches to collect data, and disseminate science and science-based decision-support tools to land use decision-makers. These tools include ConservationDrones.org, the REDDCalculator.com, the SpeciesExtinctionCalculator.com, the LandUseCalculator.com, and DeforLeaks.org. Serge Wich is Professor at the Research Centre in Evolutionary Anthropology and Palaeoecology at Liverpool John Moores University. His research focuses on on primate behavioral ecology, tropical rain forest ecology and conservation of primates and their habitats. Research is strongly focused on the Indonesian island of Sumatra and Borneo and uses a mixture of observational and experimental fieldwork. At present the key species Serge studies is the Sumatran orangutan where he is involved in research at various field sites of wild and reintroduced orangutans. Serge is also involved in island-wide surveys and analyses of orangutan distribution and density and the impact of land use changes on their populations. Lian Pin and Serge developed ConservationDrone.org. 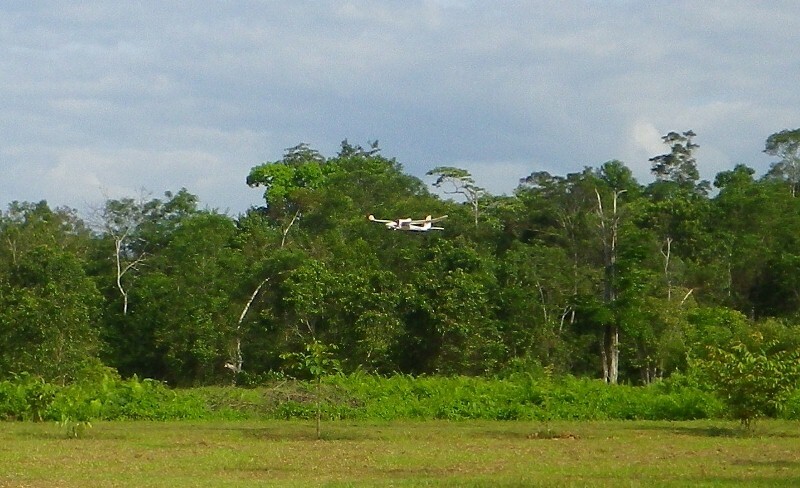 To learn more about the Conservation Drone Project and to help support this innovative research project, please visit the Orangutan Conservancy wesbite projects page. This From the Forest essay was edited by Tom Mills. 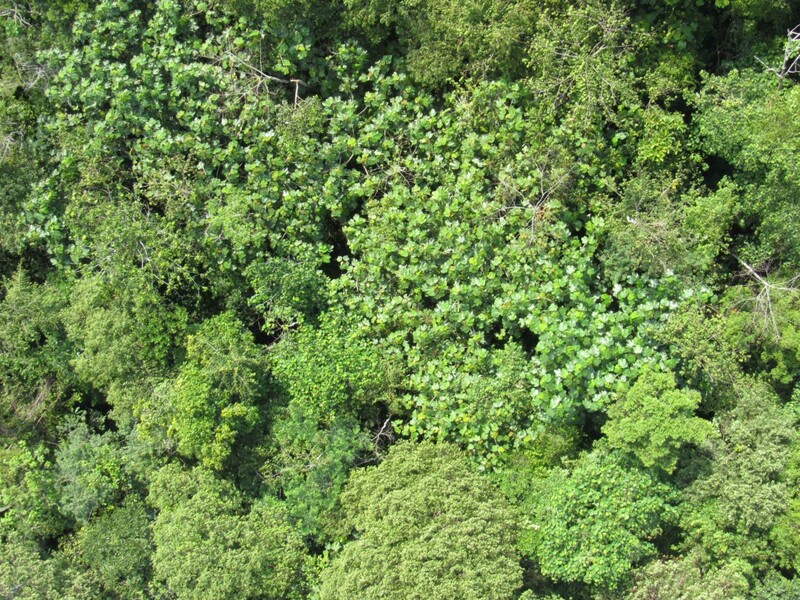 I have written a YA book and was hoping I could use your picture of the aerial shot of the one above with the Macaranga tree title as a front cover. The book will only be for family/friends and will only be a small paper copy. If I do ever get it published and it goes into the big wide world I will let you know. Yes, it is fine to use that image. Its really a nice post The Conservation Drone Project.i really give appreciate for this project and really helpful for someone are trying to learn about drone justice in USA.